This book was a great resource during our recent float trip through the Grand Canyon. The geological and historical information provided a very comprehensive view of the canyon. Great old photos. All of the rapids, with their rating, were listed on a mile-by-mile map of the river. Huge help! I also liked the section on the plants and animals commonly seen in the area. I ordered a second copy for the friends we went with and they found it equally helpful. A must read for all taking a trip down the Grand Canyon! I’m writing an article on the amazing adventure my 70-year-old twin sister and I just took on the Colorado River inside the Grand Canyon. I was too excited to take notes during the week on the river; so I bought this book to be able to add historical details and names of some of the places we explored. Everyone going on this adventure of a lifetime needs to have one of these books. I’m glad this product has pictures of some of the inside pages because that gave me some hope that this might possibly be a useful purchase for an upcoming full canyon river rafting trip. And it definitely did not disappoint! Don’t let the cover art fool you, this guide is a must-have purchase for a river rafting trip. It is simultaneously easy to follow yet jam packed full of details, historical insights, gorgeous photos. But the one thing I can’t stop raving about to friends and family is the stunning topographical mile-by-mile map of the river that is unparalleled to any other guide I’ve seen out there. The geological background is also amazing and extremely interesting. I have not yet gone on my trip, but I am definitely taking this guide on my trip for reference, follow up reading about the sites we see as well as journaling my trip along the river and through Grand Canyon. In the summer of 2012 my wife & I participated in a guided rafting trip through 226 miles of the Grand Canyon from Lees Ferry to Diamond Creek. During the entire trip, this waterproof book was a constant companion. The book was provided by the rafting company we went with, and I’ll admit that before the trip I didn’t expect the book to be all that interesting. However, I was soon singing its praises.The mile-by-mile river map is one of the best touring maps I’ve come across, as it’s LOADED with tidbits of information that don’t overwhelm the reader with too many details. Moreover, it’s very easy to track one’s progress down the river, as virtually all rapids are clearly labeled with location, class, drop, and length. Likewise, other features such as points of geologic interest, archeological sites, historical sites, etc. are plotted too.The write-up on the canyon’s formation and its overall geology is excellent and very well illustrated, as are the sections on plant & animal life and human history.There’s even a great section full of simple tips on how to improve your outdoor photography while in the canyon and on the water.I ended up reading the ENTIRE book cover to cover while on our trip, and it REALLY enriched my experience. By trip’s end, the cover had come off, but that’s just a battle scar to be proud of! Other than that, this book survived all 226 miles of rapids and flat water. It spent each day of the trip being soaked and dried, soaked and dried, soaked and dried. And it was nearly washed overboard at least three times in three of the BIG rapids. For two weeks after the trip I combed back through the book’s maps and my notes that I made therein while on the water. This book has proven itself to be one of the best travel companions I’ve ever had. Finally, this is not a technical “river runner’s guide.” You’ll need other books & maps for that. 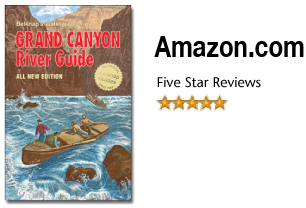 Rather, this is a great book to supplement a Grand Canyon River Trip! We just retuned from an 8 day rafting trip through the Grand Canyon and found the guide invaluable. The maps and the pictures seemed very accurate; the wildlife sections and the historical sections were also very helpful. The guide also was truly waterproof. Ours got wet every day; I never dried it out page by page like it suggested and it was always fine the next day.